A Boeing 747 "Dreamlifter" takes off Thursday the day after it mistakenly landed at Col. James Jabara Airport in Wichita, Kan. The jet landed Wednesday evening at the airport, about 8 miles north of its intended destination, the McConnell Air Force Base. A behemoth Boeing air freighter found its way to the correct Air Force base Thursday, a day after it mistakenly landed at a nearby smaller airport that officials feared had too short of a runway for takeoff. The 235-foot-long aircraft, bound for McConnell Air Force Base in Wichita, Kan., landed Wednesday night instead at Col. James Jabara, a tiny commercial airport, and officials had scrambled to come up with a plan to get it back in the air. On Thursday afternoon, it easily took off from Jabara, and landed without a hitch at its intended destination about 15 minutes later. A massive cargo plane mistakenly lands at small commercial Kansas airport, rather than their intended target of a nearby Air Force base. NBC's Chris Clackum reports. Officials shut down a highway near Jabara and surrounding roads as a safety precaution before the takeoff. A crowd gathered by Jabara to watch the plane take off from the 6,100-foot-long runway, which was about 3,000 feet shorter than is ideal for a plane so massive. Cheers were heard after the jet took off. More than 10 hours after the mixup, an airport official said they had managed to turn around the "Dreamlifter" on the runway and had determined that it could take off on the shorter runway. "They've assured us they've run all the engineering calculations...and the aircraft is safe for a normal departure at its current weight and conditions here," said Brad Christopher of the Wichita Airport Authority. He said it took "more than a three-point turn" to get the plane turned around on the 100-foot-wide runway at Jabara Airport. "They were able to do a very good job," Christopher said. The 747 aircraft, one of the largest cargo planes in the world, touched down safely at Jabara at 9:38 p.m. CT Wednesday — eight miles from where it was supposed to land. A recording of a radio conversation with air traffic controllers appears to show that crew members were still unsure of their location even after landing at Jabara, which has no control tower and doesn't normally handle cargo traffic. Wichita Mid-Continent Airport is the main commercial airport in the region. In the recording, one of the pilots can be heard mistakenly telling the control tower at AFB McConnell that they landed at nearby Beech Factory Airport, then asking for details of other airports in the area. "Let me ask you this, how many airports...are there?" one of the crew members is heard asking. Officials were initially worried that the plane — which weighs 400,000 pounds even when empty — would be grounded because Jabara’s runway is about half the length of the runways at AFB McConnell. But by morning they had determined there was enough room for a takeoff and scheduled an afternoon departure to McConnell, where the plane unloaded. 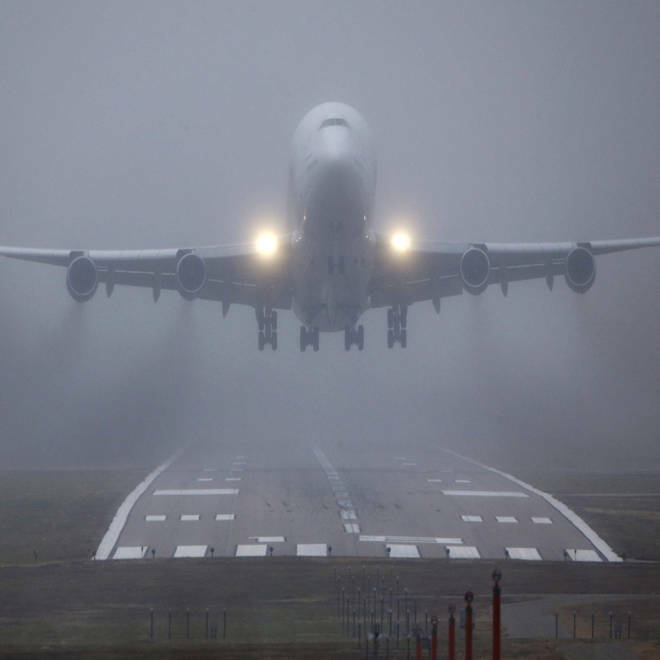 Visibility in Wichita was four miles with some fog Thursday before the takeoff, and skies were overcast, according to The Weather Channel. Wind gusts of up to 30 mph were recorded. The plane, modified from the Boeing 747 to carry Boeing air parts, is one of only four of its kind. Dreamlifter cargo plane lands tonight at Jabara. No one injured, no property damage. Plane was headed to McAFB. More details later.